Jen Ferguson is a Bible teacher at her church, retreat speaker, and host of an online women’s community called Soli Deo Gloria Sisterhood. She graduated from Trinity University in San Antonio, Texas, and holds a master’s degree in education. Craig Ferguson is a manager at a consumer electronics corporation and the involved father of two little girls. 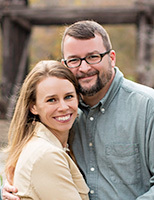 Craig and Jen reside near Austin, Texas, where they are happily married and thankful for God’s ongoing work in their lives.